KIEV, Ukraine -- By leaving millions of pro-Russian voters out of the electoral process, the ballot will only deepen the rifts that lie beneath the war in eastern Ukraine. 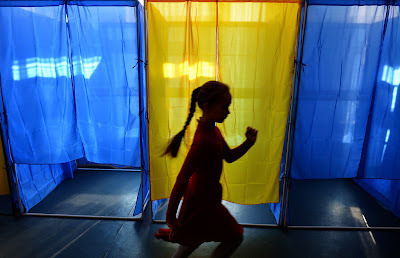 A girl walks past booths at a polling station in Kiev on October 25, 2014, on the eve of the country's parliamentary elections. The lynch mob caught up with Nestor Shufrich on Sept. 30, when he was campaigning for re-election to Ukraine’s parliament. Outside the press conference he was due to give that day in the port city of Odessa, a gang of activists and right wing thugs were waiting for him with a garbage dumpster, into which they had planned to stuff the lawmaker in front of the assembled journalists. The ambush, part of a broader purge of politicians who are seen as sympathetic toward Russia, did not work out. Shufrich heard about it and cancelled the appearance. But the mob soon tracked him down inside the local government headquarters, tore his clothes off and beat him until his eyes swelled, his head concussed and blood poured from his nose. A few weeks later, on the final stretch of the campaign, Shufrich recalled the incident like an occupational hazard. “These things come with the territory now, unfortunately,” he says on Friday, two days before the parliamentary ballot that will be held this weekend in most of the country, but not all of it. The huge parts of eastern Ukraine that are under the control of pro-Russian separatist rebels will not take part in the vote, and neither will the southern region of Crimea, which Russia invaded and annexed in March. “That means millions of our constituents will not be represented in this parliament,” Shufrich tells TIME. Probably not much at all. In the eight months since the revolution booted Ukraine’s Moscow-backed leaders from power, the country’s political discourse has devolved into a kind of blood sport, and Russia’s military meddling in Ukraine has only served to radicalize the political scene further in the lead up to the vote. Pro-Russian politicians from the old regime have been forced to flee the country in droves, typically to Russia, where the ousted President Viktor Yanukovych took refuge in February. The members of his party who stayed behind, such as Shufrich, have been routinely arrested and charged with separatism, attacked in the streets, beaten or thrown into dumpsters by crowds of vigilantes. An alarming number of Ukrainians seem to support the forces behind these attacks. According to the latest opinion polls, the populists set to take second place in these elections are from the aptly named Radical Party, which uses a pitchfork as its logo and treats even the vaguest relation or sympathy to Russia as a political mark of the devil. For Ukraine’s new president, Petro Poroshenko, all this makes it a lot harder to pursue the peace agenda that helped get him elected in May. His political party, the Bloc of Petro Poroshenko, is still set to get the most votes in these elections, but its ability to pursue negotiations with Russia and reconciliation with the separatists in eastern Ukraine will run up against the nationalists and militants with whom the party will have to share the legislative branch. In an address to the nation two weeks before the vote, Poroshenko admitted that the peace process he initiated in September, including a shaky ceasefire agreed with the pro-Russian rebels, “is constantly attacked by the gung-ho patriots,” an oblique reference to nationalist groups like the Radical Party and its loudmouthed leader Oleh Lyashko. “These people are, for the most part, divorced from reality and eager to criticize,” he said. That will be a lot harder than he makes it sound. At the heart of his peace plan has been a series of concessions to the pro-Russian rebels in eastern Ukraine, which he has allowed to elect their own separatist leaders and enjoy broad autonomy from the central government in Kiev. These acts of appeasement have been enough to slow the fighting around the conflict zones in the past month and a half, but they have also incensed the hardline political forces that want nothing short of a military victory over the separatists. The most radical among them have been the paramilitary commanders leading the fight against the rebels on the front lines and, more recently, campaigning for places in parliament. One of them, the ultranationalist Andriy Biletsky, who leads a regiment of several thousand fighters, has called for Ukraine to scrap the ceasefire and push ahead with an all-out war. “We are negotiating [with Russia] from a position of weakness,” he told TIME in an interview last month in Kiev. Nor do many of the activists and protestors who rose up last winter against the Yanukovych regime. In the past few weeks, as the parliamentary elections grew near, thousands of them have again begun to demonstrate in Kiev for a harder line against the separatists, at times clashing with police in scenes that have been painfully reminiscent of the revolution that brought Poroshenko to power in the first place. These protestors do not represent a part of the electorate that can be easily ignored or sidelined. In a nationwide survey released this week, 40% of respondents said they are prepared to take to the streets for a resumption of the winter uprising if Ukraine’s new leaders fail to meet the demands of the revolution. At the heart of those demands is the drive to purge the ruling class of anyone with ties to the ousted government, and on that front Poroshenko has tried to deliver. Earlier this month, he signed the so-called “lustration” law, which would affect up to a million people who had been on the government’s payroll under the old regime. After an elaborate vetting process, these civil servants could be banned from holding any job in the state bureaucracy for a decade, thus branding a huge portion of the country as unfit for public service. It is under the vengeful spirit of this law that Shufrich and other holdouts from the Yanukovych government have been facing mob justice in the streets. “We’re like pariahs now,” he says. In the course of a few turbulent months, the purge has helped disrupt an uneasy balance of power that had held in Ukraine since the fall of the Soviet Union. The electoral map of the country had been split for years roughly down the middle with a political east-west divide. Voters in the central and western parts of the country tended to favor integration with Europe, and bristled at Russia’s frequent attempts to treat Ukraine like a wayward stepchild. But to the east and south of the Dnieper River that bisects Ukraine, and especially in the industrial eastern regions where the dominant language has always been Russian, voters broadly favored the close ties with Moscow on which their economic fortunes depended. For the past two decades, both halves of Ukrainian society had ample representation in parliament. Sometimes they turned the chamber into a venue for food fights and bare-knuckle boxing, but at least all sides got to have their say. What finally ruptured this balance was the Russian annexation of Crimea in March. Russian President Vladimir Putin, who was outraged at the revolution that toppled his ally in Kiev, sent his troops to occupy the Crimean peninsula and absorb it into Russia. But he did not win many allies in Ukraine in the process. Even the regions that had previously favored closer ties with Moscow began to see a surge of ill will toward the Russian President and the country he represents. According a survey conducted in May, two months after the annexation of Crimea, 76% of respondents had a negative view of Putin, up from 40% just a year earlier. The main exceptions to that trend were the two separatist regions of Donetsk and Luhansk, where the vast majority of people expressed support for Putin in May despite his annexation of a piece of their country. These breakaway chunks of eastern Ukraine, which are home to at least 10% of the country’s 45 million people, are now being left out of the electoral process. Instead of taking part in this weekend’s elections, the rebel-held areas in eastern Ukraine will hold their own ballots next month, thus helping to formalize their split with the rest of the country. “If you count the people of Crimea, that comes to seven million Russian-speaking voters who will not be represented in the new parliament,” says Shufrich. For the ruling government in Kiev, that might not be such a bad thing. The absence of millions of pro-Russian voters will ensure that Ukraine’s new leaders, as well as the nationalist parties, get a stronger mandate to rule at the polls, while the closest thing to a pro-Russian party running in these elections – the newfangled Opposition Bloc of Shufrich and his allies – has been so badly humiliated and demoralized by the post-revolutionary purge that it is not expected to win any seats in the parliament. This may well reflect the new anti-Russian mood in Ukraine as a whole. But it will not help heal the national divide. Instead of moving into the somewhat more civilized framework of parliamentary debate, the conflict over eastern Ukraine will still be caught up in the discourse of purges, guns and garbage dumpsters.